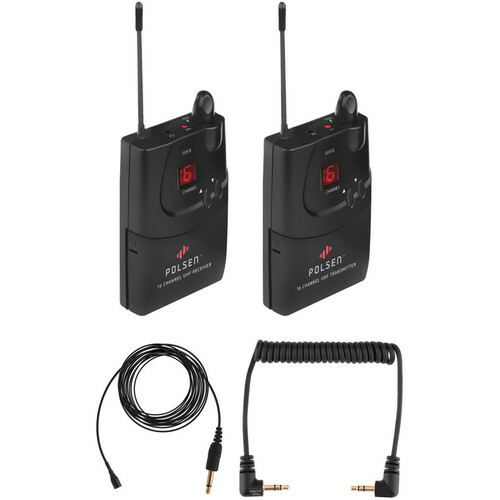 The Polsen ULW-16 UHF Wireless System and PL-4 Lavalier Microphone Kit from B&H includes a Polsen UHF ULW-16 BR beltpack/camera-mountable receiver, a ULW-16-BT beltpack transmitter, a PL-4 omnidirectional lavalier microphone with a 1/8" connector, a camera mount, belt clip, and a foam windscreen. This kit can be used by professionals and enthusiasts to capture audio for ENG (electronic news gathering), EFP (electronic field production), presentation, and video applications in various environments. In addition, an output cable (available separately) is required. The ULW-16-BR Beltpack/Camera-Mountable Receiver for the ULW-16 Wireless System from Polsen is a replacement receiver for Polsen's ULW-16 16-channel camera-mountable UHF wireless system. It's designed to receive an audio signal from the ULW-16-BT transmitter more than 100 feet away. Engineered to be exceptionally quiet, and with many professional features like line output and frequency agility, the ULW-16-BR is ideal for EFP (electronic field production) and video applications for professionals and enthusiasts alike. With its impressive 105 dB signal-to-noise ratio, the ULW-16-BR delivers pristine audio transmission for broadcast-quality recordings. It has 16 channels to choose from to help avoid interference. Up to five systems (or more in optimum conditions) can be used simultaneously in the same location. With features like easy-to-read LED indicators, the receiver also has a line output for professional cameras, and with a line to camera level attenuator cable, you can plug into 1/8" mic input for consumer cameras. A headphone jack and volume control allows you to monitor the transmission signal in real time at a comfortable volume. The system operates in the UHF 500 MHz bandwidth assuring that it is "future proof" and meets current and known future FCC regulations. It will not be affected by the planned FCC auction of the 600 MHz band. The ULW-16-BT Beltpack Transmitter for the ULW-16 Wireless System from Polsen is a replacement transmitter for Polsen's ULW-16 16-channel camera-mountable UHF wireless system. It's designed to transmit an audio signal to the ULW-16-BR transmitter more than 100 feet away. Engineered to be exceptionally quiet, and with many professional features like line input and frequency agility, the ULW-16-BT is ideal for EFP (electronic field production) and video applications for professionals and enthusiasts alike. With its impressive 105 dB signal-to-noise ratio, the ULW-16-BT delivers pristine audio transmission for broadcast-quality recordings. It has 16 channels to choose from to help avoid interference. Up to five systems (or more in optimum conditions) can be used simultaneously in the same location. The wireless transmitter features a volume control that adjusts the level of transmission. It is also equipped with a line input that enables instrument level devices to be plugged in without overload of the circuit. The Polsen PL-4 is a replacement microphone for Polsen's ULW-16 wireless system. It is also compatible with other wireless transmitters with a standard 1/8" microphone input, or devices that have a 1/8" (3.5 mm) input with plug-in power. Featuring an omnidirectional polar pattern, the PL-4 is optimized to accurately capture speech. It provides clear and natural sound ideal for ENG, EFP, and DSLR video applications. Because omnidirectional microphones are less susceptible to wind noise and vocal plosives (pops) than cardioid microphones, the PL-4 is suitable for indoor or outdoor use. The mic provides flexible placement options and allows for head movement without affecting the sound. The PL-4 comes packaged with a tie clip for securing the mic to the talent's clothing, as well as a windscreen for further reducing wind noise and vocal plosives. Box Dimensions (LxWxH) 8.4 x 3.2 x 1.8"
Box Dimensions (LxWxH) 8.4 x 3.2 x 1.9"
Box Dimensions (LxWxH) 4.7 x 2.6 x 0.8"